Originally posted: March 6, 2017 . Last modified: March 27, 2019 . A colorful take on the traditional Rice Krispies Treats recipe. Vibrant blues, pinks, purples, and yellows serve to brighten your day as you enjoy each bite. Who doesn’t enjoy a good Rice Krispies Treat?! Well, I am sure someone out there doesn’t care for them, but I am pretty sure the majority of people seem to enjoy them just fine. With that in mind, Kim and I decided to tackle this childhood favorite. Since Easter is coming up, we wondered, “Wouldn’t it be fun if we make Rice Krispies Treats in a bunch of different colors? Like Easter eggs? !” That’s when it hit me. Why not combine two Easter favorites. Peeps and treats, it sounded splendid in my head. When I mentioned it, Kim, she loved the idea. At first, we wondered if the Peeps would work. I mean, they are supposed to be made of marshmallows, but who knows, right? We came up with a backup plan just in case they melted into an unusable mass of sugar. Fortunately, nothing of the sort happened. They melted perfectly, and the colored sugar was spot on for what I had in mind. I wanted people to see these and think about all the eggs they had dyed over the years. The warm pastel colors are more than I could have asked for and I am thrilled with how the recipe turned out. The flavor is nostalgic mixing the fluffy sweetness of marshmallows with the salty crunch of rice cereal. It’s a simple recipe that you can make with your children. You could even bribe them into doing this instead of dying eggs if you hate the smell of vinegar. I think, for us at least, making this dessert will become another Easter tradition. In closing, I wish everyone long life, everlasting love, and a full stomach. Making these rice crispie’s treats is an easy process. I just want to start off by letting you know this recipe and recipe card only explains how to make one batch at a time. So, if you want all the different colors, then you will have to repeat the process, again and again, using different colors. Fortunately, it doesn’t take very long to prepare the dessert, and you can make the other batches while the first one cools. Now that we have gotten that out of the way let’s get started. First, go ahead and either use butter or a non-stick spray to coat the pan you are using. Otherwise, the cooled marshmallow with stick and tear when removing from the pan. After that take a large saucepan or stockpot and combine the butter and Peeps. Cook the mixture over low heat and stir it as the Peeps melt. Once the Peeps have fully melted, then add the cereal. You will want to stir it vigorously to make sure all the cereal gets coated with marshmallow goodness. One tip Kim offered was to spray your spatula with non-stick cooking spray before you transfer the treats from the pot to the pan. Using the spatula, spread the mixture out in the pan. Make sure to spread the treats out evenly for cooling and presentation. Then set the pan aside to cool for at least 30 to 45 minutes. While it’s cooling, you can start making other batches and taking advantage of all those bright colors offered by Peeps. It looks pretty amazing to see a huge stack of brightly colored treats on a serving plate. After everything has cooled, you should be able to cut the treats into 9 even servings. Stack them up or just devour them as is, eat them the way you wish and savor the gooey goodness. Holiday-themed recipes are fun to make. Here a few more for holidays throughout the year. Grandma’s Pumpkin Roll, Pumpkin Cheesecake, and Dark Chocolate Peppermint Truffles. 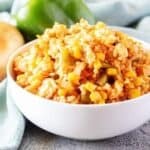 If you like this Rice Cris-peeps recipe, please leave us a comment and rate the recipe card. You can also find us on Facebook, Pinterest, Twitter and Instagram searching for Berly’s Kitchen! Use extra butter or a non-stick spray and coat a 8x8 inch square pan to ensure treats don’t stick. In a large sauce pan or stock pot combine butter and Peeps and melt the marshmallow candy on low heat while stirring. Should take approximately 8 to 10 minutes. Remove mixture from heat and stir in cereal making sure the it gets evenly coated with melted marshmallow. Transfer mixture to greased pan and spread evenly. Let cool for approximately 30 to 45 minutes then cut into even squares. Repeat process to make additional batches using multiple colors of Peeps. Makes one batch, use recipe with different colored Peeps to make multiple batches. These are just so cute!!! Oh man, Kim! I saw your pin on Pinterest and loved it! Such a fun idea and great use of those colorful little peeps. I’m going to make these with my girls! These are adorable and a genius idea! I love rice crispy squares, I’ve even been known to buy them at a certain coffee shop (will remain unnamed) for $$$ even if I know they only cost a fraction of that to make! PS: Awesome tip about spraying the spatula with non-stick cooking spray. These are brilliant. I mean, who doesn’t already love Rice Crispy Treats? Can’t wait to surprise my kids with these. Oooo this is an excellent idea! My dad is in love with rice krispies so whenever I see a recipe I save to try. Love the peeps! OH MY GOD. Not only is this cute but it looks so tasty!! Perfect for easter! Rice Cris-Peeps!? Okay, these are the stinking cutest. I love the simplicity and festivity of these precious little guys- a true crowd pleaser, for sure! Yum, I love how bright and colorful the peeps make the rice krispies treats! I am the biggest PEEPS fan — I seriously can’t wait to try this! Pinning for later, too! What a fun idea for Easter! I will admit this isn’t my typical recipe to make but this looks fun! Especially for kids! What a great treat to bring to an Easter gathering too. I love rice crispy treats!! These look so delicious!! What a perfect Easter treat. First off, love the name! I love the different colors of these, what a fun idea to celebrate spring! I will be making these for sure!! This a great combination of two of my favorite treats as kid. Thanks for sharing!! Aw these cris-peeps are the cutesst! !The colors are so perfect for Easter and they sound so simple to make. Love it! What a fun way to use peeps! Love all of the different colors of the treats. Kids must absolutely love these! This looks like something really fun to make with your kids! Thank you for bringing it to FF. So cute! Love the multi-colored rice crispies too. Thank you, Ali! The colors are the best part about making these treats. Plus, if you makes these instead of dyeing eggs, then you don’t have to smell vinegar lol!